MIT researchers managed to use graphene, deposited on top of a similar 2D material called hexagonal boron nitride (hBN), to couple the properties of the different 2D materials to provide a high degree of control over light waves. They state this has the potential to lead to new kinds of light detection, thermal-management systems, and high-resolution imaging devices. Both materials are structurally alike (in that they're both composed of hexagonal arrays of atoms that form 2D sheets), but they react to light differently. These different reactions, though, were found by the researchers to be complementary, and assist in gaining control over the behavior of light. The hybrid material blocks light upon applying a particular voltage to the graphene, while allowing a special kind of emission and propagation, called “hyperbolicity,” when a different voltage is applied. This means that an extremely thin sheet of material can interact strongly with light, allowing beams to be guided, funneled, and controlled by voltages applied to the sheet. This poses a phenomenon previously unobserved in optical systems. 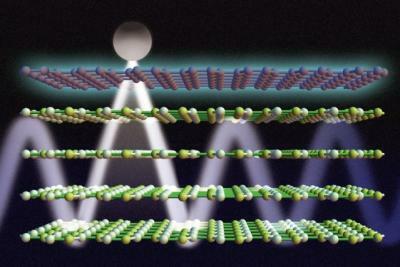 Light’s interaction with graphene produces particles called plasmons, while light interacting with hBN produces phonons. The scientists found that when the materials are combined in a certain way, the plasmons and phonons can couple, producing a strong resonance. Also, the properties of the graphene allow precise control over light, while hBN provides very strong confinement and guidance of the light. Combining the two makes it possible to create new “metamaterials” that marry the advantages of both. The combined materials create a system that can be adjusted to allow light only of certain specific wavelengths or directions to propagate, and to selectively pick which frequencies to let through and which to reject.